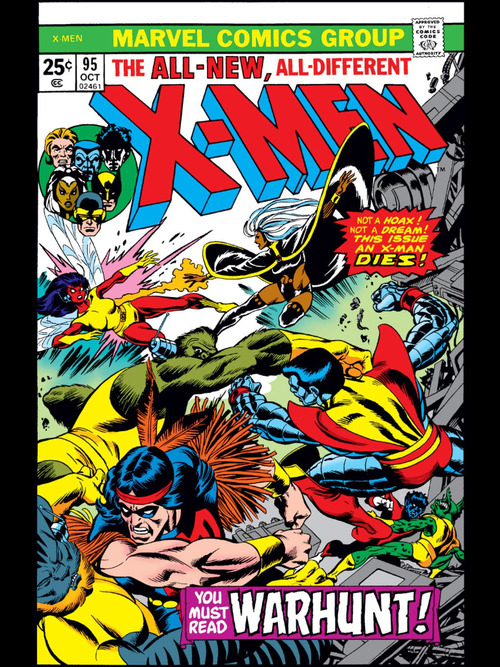 This issue takes place right after the last issue ended with the X-Men falling through the air after their jet was blown up. The X-Men team up so that none of them die in the fall. Once they reach the ground, Nightcrawler infiltrates Count Nefaria’s base with his teleportation powers. 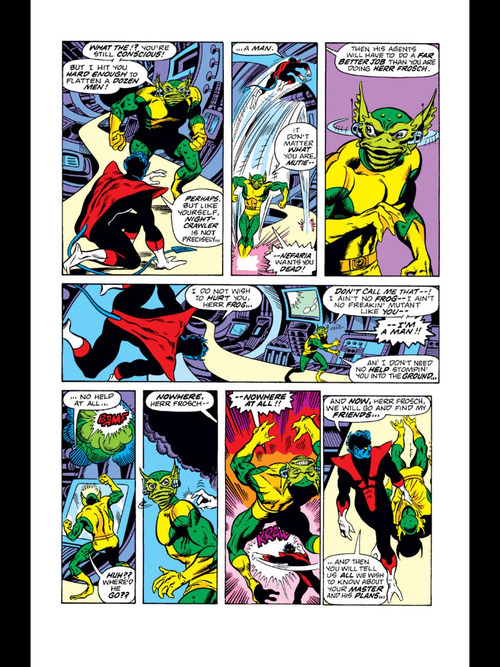 Nightcrawler battles a frog man named Croaker and then is able to let the rest of the X-Men into the evil hideout. 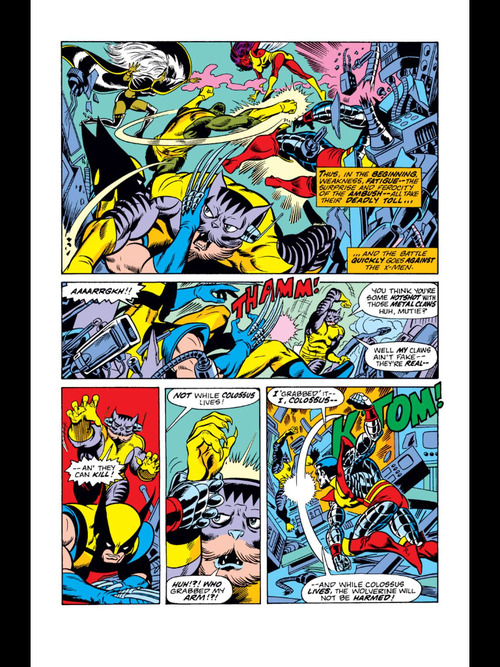 When they enter the base, the X-Men do battle against Nefaria’s Ani-Men and defeat them. However after thinking they are victorious, the X-Men realize that this was all a trap and the base will self destruct imminently. 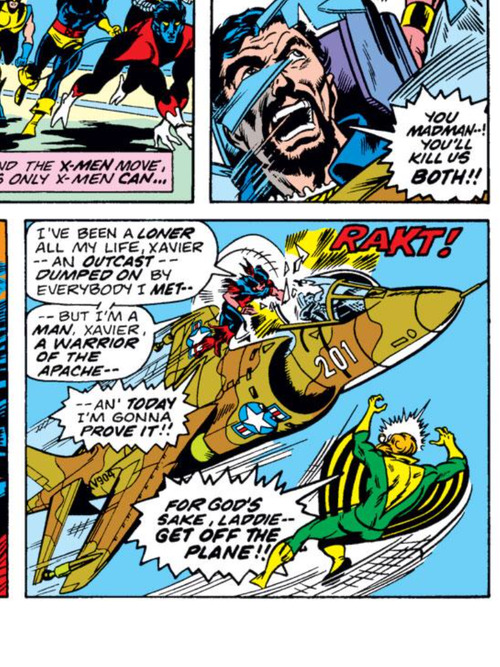 Thunderbird notices that Nefaria is trying to escape in a plane and the mutant jumps on top of the plane. 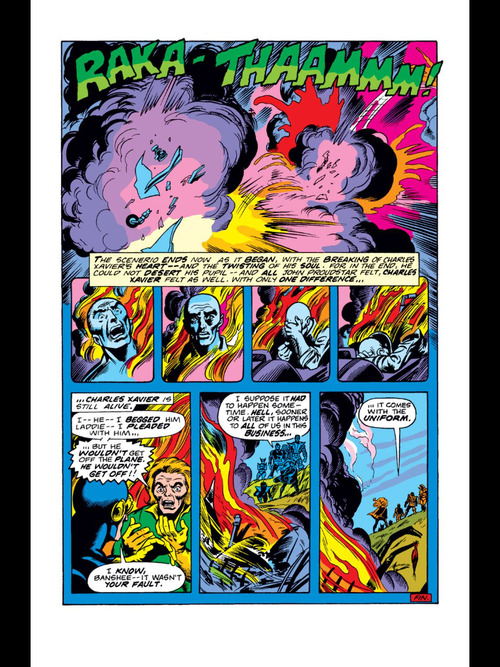 Determined to stop Nefaria, Thunderbird destroys the plane and it blows up in mid air, killing Thunderbird and theoretically killing Count Nefaria. The rest of the X-Men escape the base before it blows up, but they are all distraught when they realize that Thunderbird has died. This issue was a slight improvement over the last issue, but this is still a bad start for the Claremont run on the X-Men. Thunderbird’s death is important in the ways that it effects other characters like Cyclops and Professor X, but Thunderbird is essentially a throw away character. He only appeared in 3 issues before his death and he was barely characterized at all in his time in the X-Men universe. It seems like John Proudstar was created solely so that he could be killed. I also still hate the way Dave Cockrum draws faces. Hopefully he improves soon. This issue is not all bad though. I always enjoy the trope where the X-Men fall through the air and this one was also enjoyable. The battles between the X-Men and the Ani-Men were also enjoyable, even though the Ani-Men are very bland villains. This issue wasn’t very good, but at least it wasn’t as bad as the last issue. 1. As we see in this issue, Banshee and Professor X are greatly affected by Thunderbird’s death. The rest of the team will also show their pain at their loss in the coming issues. It’s funny how much Claremont is revered, considering his first two issues. I agree, they are really bad, even when compared to the very next issue. Obviously, it gets better. Plus, next issue introduces a long standing supporting character. These issues are bad, but he does get better! He created some of the best characters and story lines in the history of the X-Men. He wasn’t created to die but (I may have mentioned this before) this was originally going to be Giant Size Xmen 2 and the creative team decided that being quarterly, they needed a strong ending hook, and Proudstar was disposable. I had a minor objection that Cyclops firing optic blasts at the ground to slow his fall won’t really work (we’ve certainly never seen his rays pushing him back when he blasts and never will again). Yeah that cyclops bit was ridiculous and unbelievable. In reality, they actually would slow his fall. as they are concussive, it means that Newton’s laws would take effect. it’s really every other scenario that is wrong. but trying to justify comics with any sort of science logic is a bit insane. If Cyclop’s eye beams are concussive, perhaps he might learn to use them to fly. But it seems unlikely; they probably don’t propel him enough, and furthermore, they are likely to be terribly destructive of the ground underneath. Thunderbird’s death was a shame, especially as it meant two of the three minority characters were now gone, leaving Storm as the only remaining minority representation. Oddly, Storm is the only person of colour to be part of the core cast for the entirety of Claremont’s run. Yeah diversity took a big hit fast in this run of the X-Men. And that is interesting. I didn’t know that about Storm. Yeah, considering the X-Men are generally considered a franchise for exploring themes of diversity, the core team had surprisingly little of it. 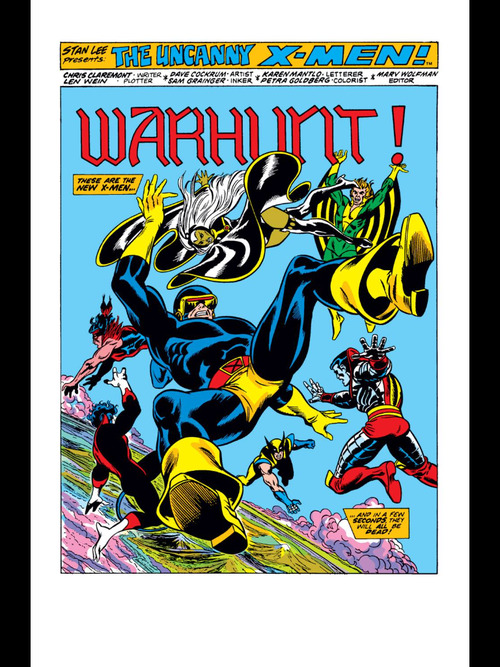 There were plenty of members – Cyclops, Jean, Storm, Wolverine, Nightcrawler, Colossus, Banshee, Kitty, Rogue, Rachel, Magneto, Psylocke, Dazzler, Longshot, Havok. But Storm was the only one of them who was a person of colour, not counting blue. Near the end of Claremont’s run, he did have a short-lived “team” that included Forge, but I’m not sure it would count. And he did bring in Jubilee, though she didn’t really join until pretty much the very, very end of Claremont’s time. The New Mutants were slightly better – Dani and Sunspot were members for almost the whole run, Karma had a couple brief stints, and Rictor was brought in near the end, though well after Claremont had stopped writing it. The number of minority characters in the X-Men franchise mostly exploded in the ’90s and 2000s. When’s the next review? Or did you decide to quite? More will come soon! I’ve started grad school and haven’t had much time but but I plan on doing a lot of reviews around Thanksgiving time! Is everything okay? That was over a year ago, I now realize as I look at the date. I hope grad school is going well! Good luck. Grad school is going well! Sadly I haven’t had any time to do this blog in forever, but I graduate next month so hopefully I’ll have time again after that! I’m glad you like the blog! Well, congratulations then! I’ll check back some time. I’m about due for another re-read of Claremont’s legendary run anyway. By any chance have you continued reviewing Uncanny X-Men on a different blog or did you quit blogging completely? I just started reading Christ Claremont’s run and remembered your blog but you stopped after two issues into it.